With the era of web and app presence, the business world is totally changing. Today every company have an online presence (website). From the app that reminds you of drinking water and alerts you about your fitness to the app that helps you count the compound interest for your loans, everything is becoming mobile friendly. The numbers of mobile apps in app stores are also increasing day by day with the count of useful apps and worthless apps. Apps have been so important in our lives that we run out of the storage space in our mobile phones. How about if I say that you can have unlimited apps without lacking storage space. Yeah, this is possible with PWA – Progressive Web Apps. Let’s get familiar with the PWA. Progressive web apps are the web pages with lightweight to load faster and acts as the mobile app when loaded on mobile. It also uses less space, fewer data and can work offline. Progressive apps are similar to mobile websites with more specialized features and operate in the way that we feel like its a mobile app. It is just like the website with customized features like to load faster, facility to use it offline, Push intelligence and some of the other features that are easily available on the browsers like Google chrome, firefox, and opera. PWA has gain fame and popularity with regards to operating in less data than mobile apps and working successfully without an internet connection. There is an increase in global marketers utilizing progressive web apps and analyze the user experience on mobile without application development for it. Now here the more clear question arises. Why PWA is not mainstream yet? This technology and concept are around from 2005 but today’s trending improvements in languages such as HTML5 has made it easier to convert your website into PWA. Because of this, the developers and designer are attracted more towards it. In the case of Native apps, the developers need to build three different apps for Android, iOS, and Windows. But with PWA the development is only for once. This makes the developers task easy. The other issue that the native apps face is called App Install Friction. Now from the recent study, it is estimated that to install a native app, users need to make approx 6 clicks and with each click, you can lose about 20% of the users. 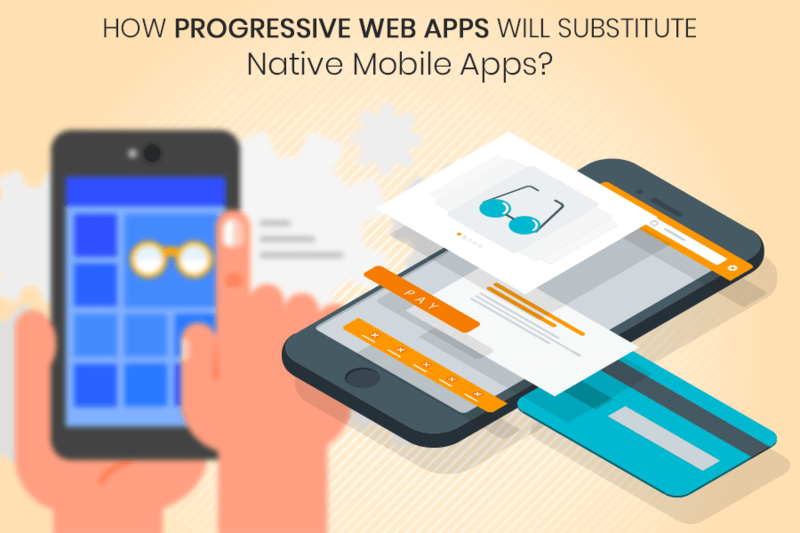 And therefore, the native apps are more difficult to install than progressive web apps. Besides these, there is more to the story with more advantages. Have you ever surfed the food delivery app and searched the menu of that one restaurant. And if you didn’t get the menu then I think at that moment you would be the most frustrated person with the empty stomach. And I agree that this happens with every other person. Now, this might happen in native apps but not in progressive web apps. Because although your apps have their own search option, if you want to search the other menus it would not crawl by the search engine. But PWA can be. Search the stuff in Google and get the results from content inside the progressive apps. The PWA once opened in a web browser, automatically saves the cache in the browser. This implies that you can later access the web page in an offline mode. The user can get access to any article or website or blog anytime without the internet connection. Push Notifications are not just sent by mobile apps. PWA also supports this push notification API which means it can support browser push notifications. Web push notifications are small clickable notifications that appear on yr web or mobile browser while you are online. These notifications are sent by websites instead of apps. So this is another reason why you can appeal to use PWA. With high app install friction action, asking the users to install a mobile app and the ado of going to the app store, find the right app and then installing it is a very tedious task. And with the crappy internet connection, it is next to impossible. Instead of doing all this, it is much simpler to start with progressive web apps. What special in PWA is it takes less than a second for installation and less than a megabyte to occupy the storage space. Mobile app development is not always a cost-effective solution to increase customer experience. It needs a lot of time and money for mobile app development and if it is going to be popular than it should be present on all the platforms and this can rise up the cost. The PWA in alteration is budget-friendly and can be build up in a very short period of time. The PWA is still infamous and daily it is improving adding some new features and functions in developing. Soon, they will be able to access most of the mobile devices areas and who knows it might replace the native mobile apps. Today, Most of the web development companies is noticing the prominence of progressive web apps. Besides obtaining the low bounce rate and webpage loading speed, PWA has also gained fame due to the high value from the Search Engine Optimization. From the PWA structure, users experience a pleasant and favorable interface which is beneficiary for marketing of the website. 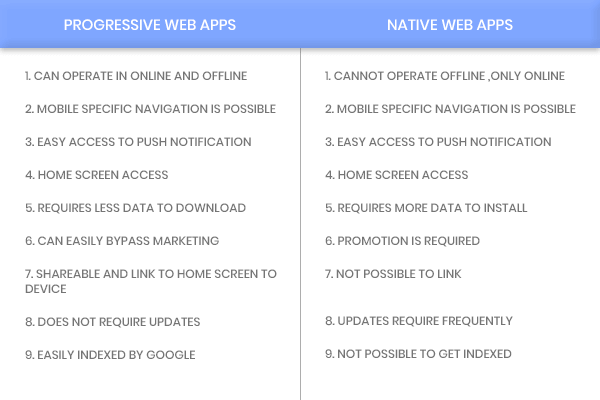 So, with this information, what do you think, is progressive web apps substituting the native apps? ?